With the treaty in which Matilda’s son Henery II (1154-1189) came to the throne, the coinage of England did not immediately reflect the political change. The coinage Stephen continued to be minted until 1158 before a new coinage bearing Henry’s name appeared. The money supply contained a high proportion of irregular and sub-standard silver pennies many of which were cut into half-pennies and farthings. Due to this deplorable state of the money supply, it became necessary to begin a massive coinage replacement program. Thirty mints were employed in this re-coinage in which a new series of silver pennies were issued. Once the re-minting had been completed, however, not more than a dozen mints were retained. Still, the coinage tended to be poorly struck on irregular planchets. In 1180 a new type of coinage known as the Short Cross issue was introduced. This new coinage continued through the latter part of Henry II’s reign and into the reigns of his sons Richard and John and finally into his grandson Henry III. The entire issue bears the name ‘hENRICVS’ and as such no English coins with names of Richard or John were ever issued. The only coins bearing Richard’s name are from his territories of Aquitaine and Poitou in Western France. During the reign of John (1199-1216) another re-coinage was initiated in 1205. Once again the money supply needed to be replaced and expanded. Sixteen mints were employed to accomplish this major re-coinage effort. Cut pennies were still quite common within the money supply until the reign of Henry III (1216-72). Halfpenny and farthings were issued although in minimal quantities. By 1247, the coinage in circulation was once again deplorable. Between pennies being cut, another major problem was continued clipping. Henry III embarked on a major monetary reform which was long overdue. In an attempt to reverse this trend, a new coinage was introduced known as the ‘Long Cross’ issue. This new issue took the cross on the reverse and extended it to the edges (Long Cross) in an effort to provide a deterent against clipping. In addition, Henry III also reintroduced the half-pence. However, few appear to have been issued based upon the rarity among surviving examples today. In 1257, Henry III wanted to bring England into the modern age of the 13th century. After nearly 600 years, gold at last began to be reintroduced to the monetary system. New gold coinages first appeared in the Italian cities of Brindisi (1232), Florence (1252) and Genoa (1253). 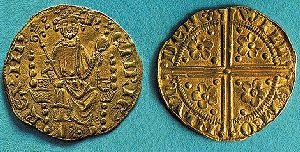 Henry III issued his gold ‘Penny’ valued at 21 silver pence at twice the weight of the silver penny. While this first attempt at issuing gold coinage failed due to the fact that it seriously under valued gold relative to silver, it did mark the beginning of a new age in the English monetary system. During the reign of Edward I (1272-1307), the silver coinage continued to be crude in style and cut into halfpennies and farthings leaving the money supply once again in a deplorable state. In 1279, yet another monetary reform was undertaken whereby another major re-coinage was attempted. However, in addition replacing the penny, new denominations were also introduced for the first time in sufficient quantity. The monetary reform of Edward I introduced the halfpence and farthings along with a completely new denomination – the fourpence. Once again, the English monetary system was being influenced by Europe. The introduction of the 4p was in response to the French silver ‘Gros’ (4 denier) issued by Louis IX (1226-1270), which is why the English 4p became known as the ‘Groat.’ However, the 4p was issued during the first re-coinage between 1279 and 1282 and was not issued again until 1351. Clearly, inflation had taken its toll and the purchasing power of the mere silver penny was declining rather steadily. As this pressure continued, larger denominations needed to be added to the monetary system. Therefore, the monetary reform of Edward I, in combination with the attempt to introduce a gold penny by Henry III, marked a distinct line in history confirming the resurection of prosperity and economic activity from the depths of the Dark Ages. These monetary reforms were the first attempt at establishing a broarder monetary system since the collapse of the Roman Empire of the West. Edward I’s monetary reform (1279-81) effort also established a new mint administration which was much more centralized. The old Roman Republican practice of including the moneyer’s name in the coinage was also abandoned, for the most part, at this time. Another re-coinage was undertaken in 1299-1302 in an effort to remint a new lightweight series of coins in part due to a flood of counterfeits known as ‘esterlings’ which were foreign copies of the English pennies (usually debased) primarily originating from the Low Countries. Edward II (1307-27) continued to issue the penny, halfpenny and farthing but made no attempt to issue either gold or the 4p groat. Edward III (1327-77) continued at first to issue the lightweight penny, halfpenny and farthing denominations. However, the strains of inflation persisted, particularly in Europe. The English were slow to debase their coinage and as a result, much silver flowed to Europe. Eventually, this drain on the money supply within England forced a debasement of the silver halfpence and farthing coinage in 1335. These two silver fractionals were sharply debased well below the .925 Sterling silver standard. With the beginning of the Hundred Years War in 1337, the demand for capital on the part of both the English and French had a profound impact upon the monetary history of Northern Europe. Large sums were needed and the Italian bankers stoodby ready to help. Consequently, demand for gold began to rise along with inflation and the need to engage in larger transactions. Finally, in 1344 a second attempt to introduce a new gold coinage was undertaken by Edward III who introduced the gold Florin (Double Leopard) valued at six shillings, and its half (Leopard) and its quarter (Helm). This first gold coinage was not successful and it was replaced later the same year by a heavier coinage, the Noble, valued at 6s, 8d (80 pence), half a mark or one third of a pound, together with its fractions. The Noble was lowered in weight in two stages over the next few years finally stabilizing at 120 grains by 1351. In 1344 the silver coinage had also been re-established at the old sterling standard .925, but the penny was reduced in weight to just over 20 grains. By 1351, the weight of the silver penny also declined down to a mere 18 grains while the 4p groats were once again introduced. 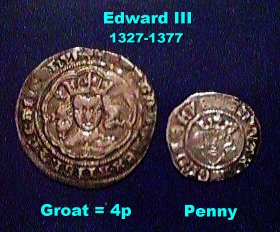 The Groat finally became a regular issue within the English monetary system until the reign of Elizabeth I. During the reign of Richard II (1377-1399), there was no significant change in the monetary system, which now included the regular issue of gold and silver denominations. For the most part, the monetary system remained fairly stable until the reign of Henry IV (1399-1413) of the House of Lancaster. It was in 1412 when the standard weights of the coinage were reduced with the noble declining by 12 grains and the penny by 3 grains. This monetary reform was largely caused by the scarcity of precious metals as well as to increase the available funds for the king due to the fact that Parliament had not renewed the royal subsidies. During the reign of Henry V (1413-22), there was no significant change to the monetary system. However, it was during the reign of Henry VI (1422-61) when the supply of gold began to decline causing a scarcity to emerge after 1426. In 1464, during the reign of Edward IV (House of York), the weight of the silver penny was reduced to 12 grains and the value of the gold noble was raised to 8s, 4d. The following year (1465), a new gold coin was issued known as the Ryal or ‘Rose Noble’ weighing 120 grains with a value of lOs. However, as 6s 8d had become the standard professional fee during this period, the demand for the old noble remained. As a result, a new coin was issued to take its place – the Angel with a weight 80 grains. In order to cope with this significant change in the monetary system, royal mints were opened at Canterbury, York, Bristol, Coventry and Norwich in order to help with the re-coinage.